This 4th of July Cupcake Flag is the end result of all the chocolate and vanilla cupcakesÂ I posted about earlier, and it would be a perfectly fitting dessert to bring to an Independence Day barbecue or other get-together. I was inspired by a cupcake flagthat I saw several months ago. I bookmarked the page with the flag’s picture, making a mental note that I needed to give the design a try when the 4th drew closer. 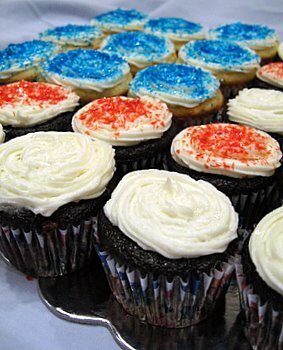 Unfortunately, when I went to look back at the instructions, I saw that the large flag called for 54 cupcakes. 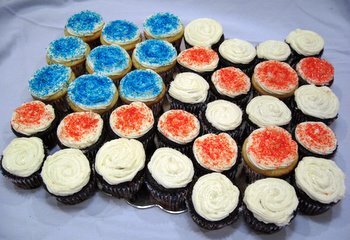 Since my parties aren’t quite that big, I scaled back the flag and cut the number of cupcakes down to 3 dozen (actually 35 cupcakes, with one for the chef). The effect is the same, but the numbers are more manageable. The flag’s construction is simple. Bake a batch (1 dozen) of vanilla cupcakes and a batch (2 dozen) of chocolate cupcakes. Make up a batch of vanilla buttercream. Top 9 cupcakes with blue frosting, 11 with red frosting and 15 with white frosting. Alternatively, you can take the lazy shortcut (as I did) and use colored sprinkles to achieve the desired color effect. Arrage on platter in flag pattern. Cream butter with an electric mixer until soft. Add vanilla and gradually add in sugar until most has been incorporated. Mixture will look a bit sandy. Add in milk as necessary (start with 2 tbsp), along with any remaining sugar, until frosting reaches an easy to work with consistency. 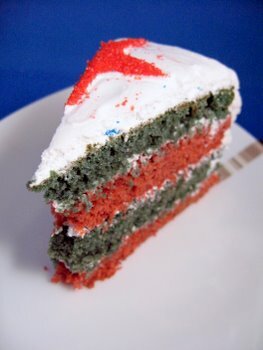 If making the flag, dye the icing as necessary with food coloring. Rewhip before using. Makes enough to frost 3 dozen cupcakes. I’m writing from the UK and although I manage to convert amounts and names of American ingredients normally – what is confectioners sugar? Is it like British caster, granulated, icing or something else? Confectioners sugar is also called “powdered” sugar. It’s very fine and fluffy, no granules at all. So it’s not caster sugar. Maybe icing sugar? In the UK, confectioner’s sugar would be called icing sugar. thanks a lot i will be making them – although perhaps not in a celebratory format! !